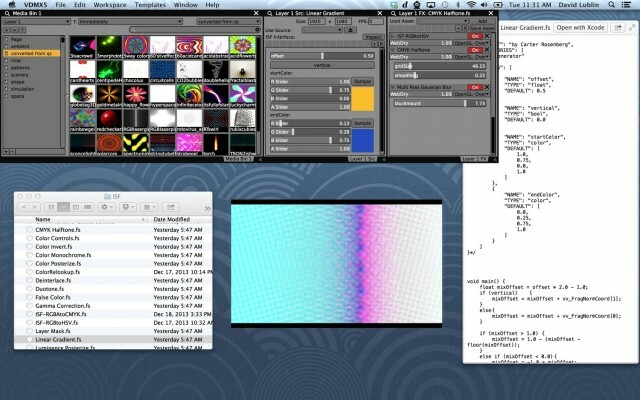 They’re a recent addition to popular OS X live visual app VDMX. But now is the perfect time to talk about the magic of shaders, generally. Standard “fragment shaders” are capable of performing feats of visual wonder as both generators and effects, using geometry and pixels. Written in GLSL, they are portable to any OpenGL-compliant graphics card, which now includes a range of modern hardware on both mobile and desktop devices. And since they run on the GPU, they do all of this magic on optimized hardware – without straining your CPU. Despite Apple’s reputation for being proprietary, they’ve been consistent in making standard OpenGL the basis of both iOS and OS X, and the success of that has added a lot to the momentum of OpenGL, generally, including on other platforms like Linux, Android, and even Windows (despite having DirectX as an alternative). So, this makes sense in a Mac-only app like VDMX. But you can test this out on those platforms, too, right in your browser. There, you can try out lots of hypnotic examples, with or without any actual knowledge of code – though this is the perfect way to start learning. We’ve started working on a new specification called ISF (“Interactive Shader Format”) which adds onto the fragment shader a small JSON blob that can be used to declare published parameters and other metadata information that can be used by the host application. It’s a pretty simple implementation, adding some simple text metadata as JSON; it doesn’t break the way GLSL works normally. Their work looks potentially promising for a lot of applications – and perhaps for other environments, from VJ apps to custom-coded environments. I’d be curious to hear what visualists and VJs do with the latest VDMX and shaders – record those sets and demo reels, people! And from developers and creative coders, I’d be eager to hear if the new format is useful.